1.0 Abstract: Sustainable development : How to make a change ? 2.0	Paper: Sustainable development : How to make a change? 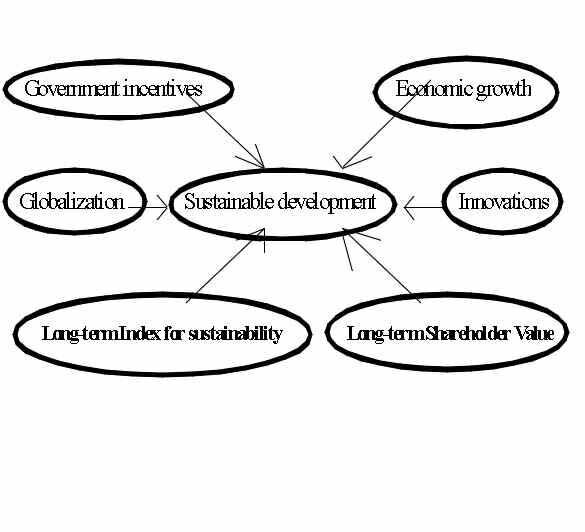 Abstract: Sustainable development : How to make a change ? Sustainable development : How to make a change ? Getting as much money as possible seems to reflect today's society very well. People don't care about ecology, social matters and positive economic development and so negative impacts result from this dramatic situation. Many cities in the world are very polluted and the forests are dying back. Besides, a lot of individuals live in terrible conditions because of inflation and lack of social help, violence as well as begging are increasing at the same time and education is neglected. Finally several firms have gone bankrupt, which leads to unemployment. How can our governments put an end to these problems and contributed to sustainable development ? First of all people have noticed that the climate has changed over the last few years. In some countries the temperature has increased by one or two degrees and natural catastrophies are becoming more and more frequent. Flooding or freshwater scarcity as well as water pollution are harming the environment of the Thirld World and developing countries and air pollution characterizes the industrialized regions. Therefore, poor and rich regions are facing a common problem which is linked to climate change, that's why they should negotiate and find a compromise as quickly as possible. If no sollution is suggested, developing countries like China will repeat the same mistakes as the developed world. In fact, the latter can expect a higher salary, which will close the gap between rich and poor regions. Accordingly, they will be able to consume more luxury products like cars and pollute more. Our governments have to intervene by developing and measuring consumption pattern. Why not launch on the market vehicles which do not emit dangerous gas ? Moreover, the firms should be interested in investing for the environment. Thus, ecological norms have to be intoduced and gain as much credibility as the norms for quality (Iso 9000). An increase in taxes could also give the companies an incentive to produce ecologically. There is a real need of consumption and production patterns for sustainable development. As far as social problems are concerned, measures should be taken in order to stop inflation and provide poor people with financial help. Nowadays some workers get a very low salary, which hardly allows them to feed their family as the food prices are too high. An adjustment has to be made. Otherwise the gap between rich and poor people will be further widened, which would lead to many difficulties. People from the street decide to steal or use violence in order to defend their rights to be integrated into society. Others take drugs. In all these cases, the government has to suggest measures to insure security in the country. Therefore, they have to hire more policemen and build new prisons. Is sustainable development achieved ? When we first look at the situation, it does not appear so dramatic. However, we can not qualify these solutions as positive. In fact, most of the budget is used to hide the poverty and the delinquency and not to eradicate them. Therefore, this money should be given for education. In fact, children brought up in good schools will act better in their future because they find a shelter there and have the feeling that the country cares for the poor. Besides, they learn how to succeed in life. As people say, knowledge is power. The fact of depriving of country of good education should be introduced in order to provide each child with the same chances of having success. The latter must learn how to read, write and use computers so that they can get an interesting job. Unfortunately, a lot of people are unemployed. This is due to the fact that small firms are swallowed up by the big ones which try to rationalize the production by using machines instead of people. Our politicians should intervene and motivate young enterpreneurs to build a firm by granting them lower taxes during the first years of their business. In fact, the latter can hire other people if they are helped financially and thus reduce unemployment. Moreover, competitivity will be maintained thanks to the existence of small and middle size companies so that the prices will remain stable. The consumers will benefit from advantageous products and keep on buying. Therefore, small business will survive. In conclusion, sustainable development can be achieved if a positive social, environmental and economic development is insured. In any case, people should be given an incentive to attain this aim. That's why our politicians should intoduce lower taxes as well as pattern for ecology and education. Caring for the environment and the people can create a new atmosphere in which everybody lives in security and peace. Paper: Sustainable development : How to make a change? A new period has begun with "explosive" innovations in the economy. Thanks to continuous improvements the welfare of our society can be secured. Globalization is one of the important factors for this path in connection with free trade and the reduction of protectionism in the different countries. Micro- and macroeconomic considerations become more closely connected. In special cases it is necessary that companies and the state cooperate to obtain a sustainable development. In the long range, innovations and knowledge are very important keys for success to attain a positive development in economy, ecology and social life. Globalization has changed the world : all dimensions of the universe are getting smaller. We have to think in a global way and look for new possibilities of being competitive. All the companies nowadays must develop new ways of maintaining existing lines of markets and finding new ones, which constitute the fundamental source of competitive advantage. Only learning can create new knowledge that is manifested in innovations, which then require new learning to use the new technologies effectively. Therefore knowledge contributes to productivity growth. When new technologies are launched in the market and the Dow Jones Industrial Index goes up, this is an indicator that the companies are successful. The economy expands and the standard of living can rise. Innovations have positive social effects because they create confidence in the mind of entrepreneurs, customers and employees. When people see their wealth increasing, they are more motivated to allocate part of their revenue to buy more products which are not harmful to the environment. New products are closely connected with the invention of new processes and mostly costs are going down with the progress of the innovation process. Frequently, this leads to outsourcing of activities and allows a better allocation of resources in connection with the specialization. With higher qualifications it is more easy to find innovations, which frequently can be diffused in the market without high efforts. So it is possible to reduce useless advertisements for old products. The invention of E-commerce has also brought an important advantage by reducing travelling costs. A conference organized on the WWW implies no damage for the environment as the participants stay at their homes for communicating with each other. The government also tries to promote ecology by giving incentives to use grid electrical power such as hydro, solar, biomass, wind and gas turbine instead of damaging resources. The market justifies such a trend while increasing price stock for renewable energy. Even the private companies care about ecology. As a consequence of global warming and the worsening of urban air pollution, 33% of Honda's budget has been allocated for engine research. Some innovators succeeded in inventing fuel cells and hydrogen-powered vehicles. Some years later, Mercedes launched in the market the first solar energy car. Is this a sign that oil-driven engines will disappear in near future ? One of the main reason in favour of innovation lies in the ability of the entrepreneur to introduce new organizational models. In industrialized countries, centralized management systems have been replaced by decentralized management. So the employees have the opportunity to take part in the expansion of the company by suggesting new ideas. An innovation can be launched in the market through several ideas. Many entrepreneurs try to activate the ideas of the employees by giving them an incentive through the distribution of shares. So the employees have an interest in working well and using the resources efficiently. At the same time, global consumption is improved. As far as the organization is concerned, many problems must be faced. In fact, most of the companies are not able to meet today's challenges. They do not see a sustainable development by being not able to think ahead into structural changes. This was the case of IBM, Hewlet-Packard, Data General and Apple Computer where there was a lack in management, while these companies officially have been considered as well-managed. This implies the introduction of new approaches to management for manufacturing, development, distribution, marketing or sales. "Sustaining innovations", in the contrary, consider fundamental changes especially of technologies under long-term aspects, taking into account ecological and social cost. Under this aspect sustainable development can reduce strong volatilities of the value of companies in the market. The main reason for failure lies in the short-term behaviour of the managers, who promote the "desruptive technologies" to make the « short-term shareholder value » rise. While acting myopically, they make the market very volatile, which is dangerous for the stakeholders as well as the company. In reality, everybody is endangered as there is a risk that the shareholder lose their money and the workers become jobless with a decrease in the shareholer value. Such a quantitive measure can not be qualified as satisfying as it is only based on a short-term performance evaluation of managers. That's why the shareholder value is not adopted by the Japanese managers. They prefer relying on a less sophisticated tool, known as the return of sales. » The short-term pressures of the market influence the decisions of companies and lead to a non optimal behaviour. As a consequence of lack of strategy in investment as well as in research and development, the companies get into trouble. Therefore it is our task to redefine the discounted cash flow, the so called Net Present Value which is closely related to the shareholder value. Furthermore, we have to implement a « long-term shareholder value », which is linked too to new organizational capabilities and requires the evaluation of future aspects combined with the shareholder value. The long-term shareholder value will not suppress disruptive innovations and so will contribute to the competitiveness of the company. This happened to MG Motors some years ago. Because of high cost of implementation this company decided to give up disruptive innovations, which would have brought success. At his time Schumpeter has already recognized the positive effects of disruptive innovations, which he called destructive. In this new millenieum we should especially consider future risks. In fact, they are very important in connection with clean technologies. Even the index for sustainable development introduced at the stock market in 1999 should also incoporate future risks in order to really aim at sustainability. Such an index created a revolution in 1999 as it was the first time that the stock exchange began to care about ecological and social aspects which primarly are of short-term type. The sustainable development index comprises two hundred companies and gives a too optimistic picture for investors. Taking into account the aspects of sustainability the index should be lower ; it is supposed to have a positive bias. With respect to the next generation, there is an urgent need for government incentives. The state should promote innovations in clean technologies. It would be worthwhile to lower taxes for companies specializing in environmentally-friendly products or services. Sharp thinking is important for survival, as it gives an incentive to innovate and creates a better and sustainable future. Another solution of today's problems lies in the capacity of the state to encourage universities and governments laboratories to make long-term research instead of projects that promise an early payoff. To this extent, exchanges and collaboration between universities and laboratories should be promoted. The diffusion of knowledge and experiences gives impulses for innovations. Research and development going into innovations push the market. So for clean technologies we have a sustainable development as long as customers agree to pay for. In this way innovations are promoted exclusively by the market. In special cases there is a need for government intervention. The state can create a climate in which technologic development of technologies is encouraged. Sometimes there may be a fear that innovations reduce employment. But empirical studies studies show that in the long range the improvements of productivity and the resulting additionnal employment compensate this loss of jobs. Finally an innovative society should have the goal to contribute to sustainability by economic growth and to create jobs under the long-term perspective.